Jackpot Capital Casino has just started their big summer bonuses event. 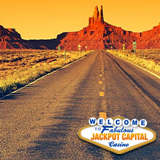 During the Hit the Road casino bonuses promotion, they'll be giving away $100,000 to both frequent and occasional players as they visit favorite American tourist attractions like the Grand Canyon, the Golden Gate Bridge, Niagara Falls, the Statue of Liberty and the Whitehouse. Jackpot Capital players earn scoreboard points by playing in either the online casino or the new tap-and-swipe mobile casino. Top scorers get top bonuses but additional random bonuses mean both frequent and occasional players can win. Every Monday until August 23rd, $13,000 will be awarded to top players and every Friday another $5000 will be randomly awarded – so everyone has a chance to win. Additional bonuses will be posted on the casino's Facebook page. Random draws mean everyone has a chance to win. Jackpot Capital Casino has a huge selection of games from Realtime Gaming. It also offers its most popular games in its mobile casino.